One of the things that has me thinking is why aren't Customs doing more, The must know where REAL Minelabs come from So surely any would be minelabs coming from any other country should tell them that they are Fake, It's not like Minelab are a tiny company, All the customs people around the world want to do is find Drugs and the like, So when these things flood the market this is as much as their fault as it is the importers. In many cases I assume individuals buy them from places like Alibaba etc. in small quantities that are sent in plain packaging labelled as gift or similar - not labelled or externally marked as Minelab. Unless they raise a red flag in some other way customs would have no cause to check them. A large shipment would obviously be different. Just like all the other excuses they use - I got it as a gift, it was given to me for payment of work, my friends next door neighbors Uncle died & they asked me to sell it etc. etc. I thought about doing that before but knowing my luck I'd end up with the red flag or banned from eBay. For all it's faults it is handy at times. As i mentioned before on a thread here i once bid on a graphics card i won cheaply but the guy wouldnt send it and then reposted it for sale. So i opened a bogus account and blew the other bidders away to win the auction only to just ignore the guy lol. Current arsenal - Minelab Sovereign xs-2 Pro, Minelab Sterling , Fisher Goldbug2 , Minelab GPX 4500 , Homemade Banker +Yamaha pump. Yeah, so I got back to the seller ( after reading his update ), and his private message to me was, that he received this particular detector as 'part payment' for work he did ( for someone ). ( I still haven't hit ten posts yet, so can't put up a link ). a 'BUY IT NOW' ( or make an offer ) GPX 5000 for $4,500. Seller joined ebay YESTERDAY !!! Ha ! last post WAS No. 10 !!! Hi tracker by the looks of font on that minelab it looks genuine. To search for gold is searching for yourself. Hey Tracker, are you Dave from Tennant Creek? One has the 'zeros' in '5000' touching, the other has a slight space between the zeros. Does this sound legit to you ? Can't see why it's not. As always, if interested, check the serial number etc. with Minelab. How hard would be for Chinamen to buy one original unit and then copied the number couple of times. Just example that checking serial number doesn't mean you safe to buy. I bought my second hand 5k from an Asian guy in Melbourne, unopened and never registered nearly 3 years old. Everything looked genuine, phone checked the serial number(which didn't helped much, as never registered) even in Miners Den Melbourne told me it's genuine.Everything looked so suspicious.New, unopend, never used for 3 years and the guy was selling it for his brother who lives in Adelaide and apparently couldn't sell it over there. I can tell you I was in doubt until I started finding gold. Yes if you read through the the thread from the very first post you'll see there are a number of checks you should be doing hence the check the serial number ETC. remark. Anyone wanting to verify a machine & wants info on what to do should start at the first post not the last! Anyone taking a risk to buy a machine that they're unsure of right up until they have found gold is rolling the dice on their cash. Lucky it turned out ok & not a dud! READ THROUGH THE THREAD & MAKE ALL OF THE VERIFICATION CHECKS WHERE POSSIBLE. IF UNSURE PUT YOU MONEY BACK IN YOUR WALLET & KEEP LOOKING. Spare parts. Chinese gpx5000. Ordered online kinda works. Picks up large gold and metal. Threshold unstable. Best used as spare parts. 11" coil, padded arm rest, car charger, Chinese wall charger, full battery harness, copy kloss head phone's and battery. Basically straight up copy. Everything included all cords etc. Seeing a battery alone is $400 good price for a spare." HAHAHAHA IF ONLY WE COULD BUY A GPX5000 FOR $800 !!! Does it come with a harness? I would like a harness and a shaft! Just a handle and ground balance button costs $130. Control box to battery box lead $60. For the effort that goes into putting the thing together you would think it would be better than "kinda works"! Looks like good value for SPARE PARTS! Fools go where angels fear to tred. HMV $5k, White Tdi, Garrett’s Infiinium and Max, Chinese carrot, pots, pans, picks, shovels, and a lot of blurred thinking! That's what I thought. Am wondering how good or bad the battery is! 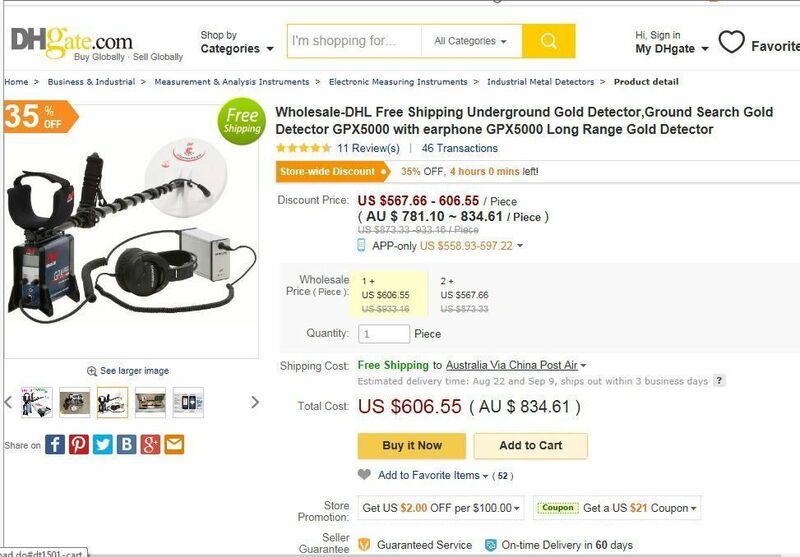 I was looking for a Goldmonster for my daughter as she loves detecting tho has trouble with my old 2200 with a 14 coil attached. So browsing eBay and saw a goldmonster with a starting bid of 500. I emailed seller for receipts.more photos ect.. No reply. Watch out guys seems fake to me. The photo in the listing is a generic picture, definitely one to be wary of.